Working with Hoskins Architects, our proposals for Oman's Renaissance Museum invites visitors to reflect on the country's past, present and future. 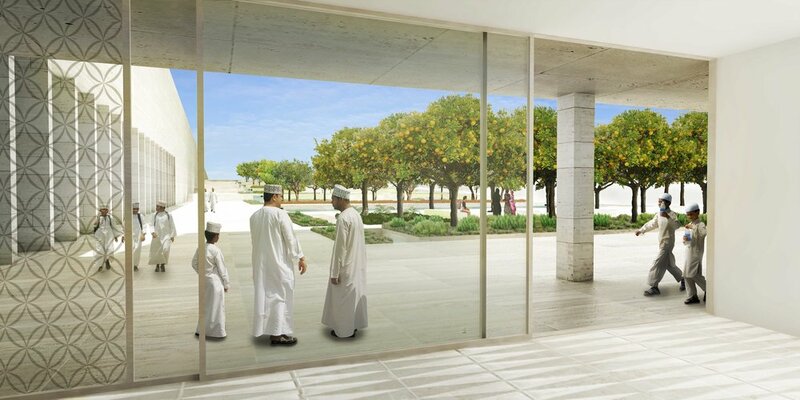 The garden is part of the museum’s interpretative story with a movement articulation that makes reference to the landscape context, acknowledging the importance of its topography and climate for Oman’s heritage, history and future. The Renaissance Museum’s garden functions as a foreground to the vistas provided by the surrounding landscape context. The garden reflects the Omani people’s interaction with nature, their respect for the local flora and fauna and their treatment of water as a precious resource for survival in a harsh climate. A central terraced garden is located within the Museum’s protective frame. The Museum’s plinth diverts the strong warm winds coming from the south and west across the desert. At the hottest time of the day, the exhibition tower casts a shadow over the garden. To the north and east, views are unobstructed by the museum building’s form to open up framed views towards the Hajar Mountains. The tripartite garden consists of a terraced garden, productive garden and wadi linked through the concept ‘water’. The terrace descends into a shaded courtyard to establish an interface with the Museum’s library and education departments at basement level. It is enveloped by a productive food garden with groves of date palms constituting views to the surrounding natural landscape and the wadi that provides a protective, subtly terraced sandy edge to the gravel plain and intermittent force of the wadi’s flood water.